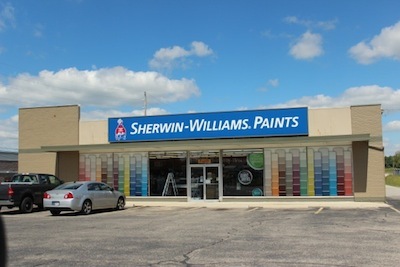 The modified bitumen roof protecting a Madison, Indiana Sherwin-Williams had reached the end of its life. Over the years, the storeowners had tried using a fiber aluminum commercial coating to patch leaks, but after repeat coatings and last year’s harsh winter, the roof simply could not hold up any longer. The roof’s 21 active leaks threatened the valuable inventory within the store, which employees had resorted to covering with plastic to prevent damage. With inventory and business in jeopardy, something had to be done quickly. 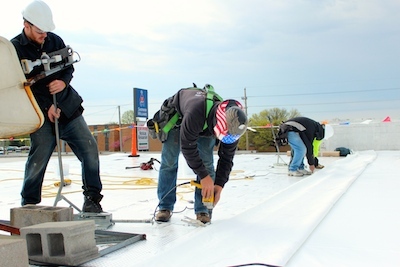 An experienced flat roofing contractor was needed to resolve the issues—fast. That’s when the store’s owner called Exterior Pro Roofing. Within 24 hours, Exterior Pro Roofing arrived on the scene to inspect the existing roof. While the modified bitumen was cracked and deteriorating, the underlying structure was solid. This meant that we could simply apply a new Duro-Last thermoplastic membrane over the existing roof, and avoid doing a costly tear-off. Exterior Pro immediately ordered the required materials, which arrived 5 days later. The day after the materials arrived, we started by installing a ½-in. of insulation to act as a barrier between the modified bitumen roof and the new Duro-Last membrane; otherwise, the tar-based bitumen would damage the thermoplastic material. Next, we mechanically fastened a white, 40-mil. Duro-Last membrane over top of the insulation to effectively seal the building from moisture. 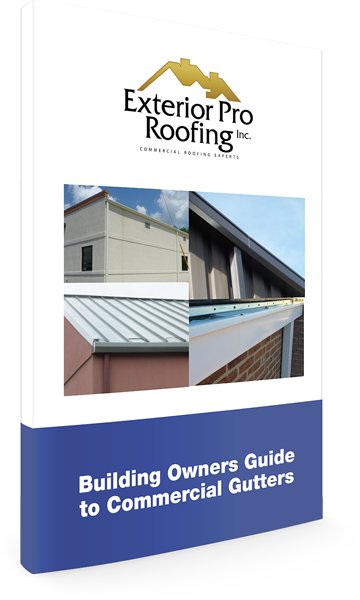 Duro-Last is a durable roofing material that is backed by a warranty. After only one day, the 5,500-sq.-ft. standalone building had been successfully re-roofed with the Duro-Last membrane. The next day, we came back to inspect our work and found that all of the leaks had stopped, ensuring the safety of the store’s inventory. This was a typical flat roofing job for Exterior Pro, a job where the experience of the contractor comes into play. No heavy machinery was required for the repair, and business was uninterrupted for the duration of the job, leaving one less concern for the store’s employees. Due to the fast action of the store’s employees and quality re-roofing done by Exterior Pro, the store lost minimal inventory and no longer has problems with leaks.